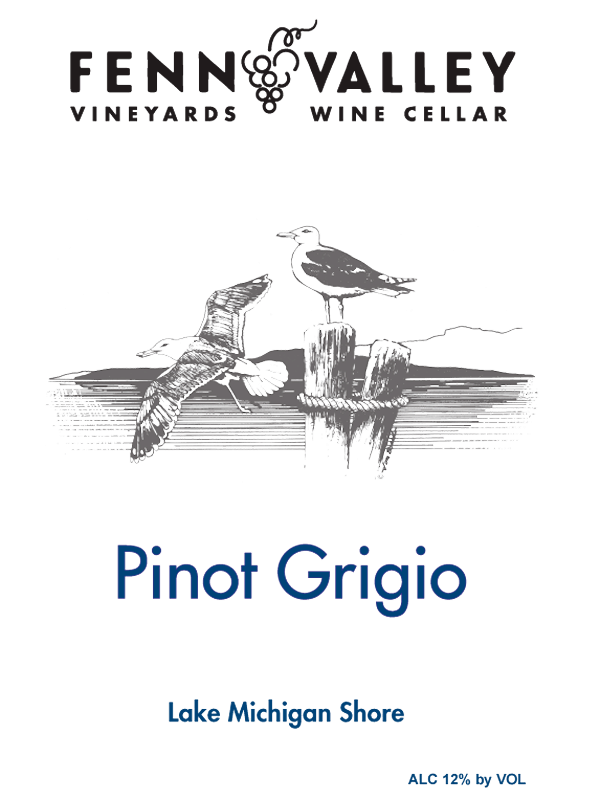 Pinot Grigio, Pinot Gris. Same grape. Different wine. As with Sauvignon Blanc and Fume Blanc, much ado is about how the juice is handled, i.e. wood or no wood. And much has to do with the climate and soil where the vines are grown. There are other factors too, but the jury seems to have already voted: Grigio (what I call the “Italian Style”) is the preferred. Speaking about “Italian,” ask a wine drinker about Pinot Grigio and she or he will probably be familiar with the varietal. And if they regularly enjoy Pinot Grigio, ask them where their wine comes from and they may say “Italy”. Where in Italy? Well, if they’re really into wine, they may even say Trento-Adige (an alpine-continental climate area in NE Italy.). But if they’re more into domestics, they may say Oregon (better known for Pinot Gris) or California. But Michigan? Probably not. Too bad. Fenn Valley Vineyards, at latitude 42.57 degrees N shares some characteristics with Alto-Adige at 46.43 N. Fenn Valley enjoys a continental climate moderated by its proximity to Lake Michigan. Soils within the Alto-Adige (a MUCH larger area) are more varied and may contain sandy marl, volcanic porphyrl, quartz, mica or dolomite (or a mix of these to some extent). Fennvile (the oldest AVA in Michigan and 3rd oldest in ALL the U.S.) is smaller than Alto-Adige and the soil is primarily sandy and infertile. (Grapes grown on fertile soil – encouraging leaf vigor and vine growth – will not make for good wine while deep sand encourages root growth). So important is this that despite Fennvile being its own AVA within the larger Lake Michigan Shores AVA (of SW Michigan) its unique topography (and distinct AVA classification) acknowledges the large sand ridge (and higher elevation) extending inland from Lake Michigan between the Black River and the Kalamazoo River Valleys. Fenn Valley Vineyards and Winery was the first such classified in Fennville and remains the only such classified vineyard today. Despite being within the larger Lake Michigan Shore AVA to the south, its unique topological character and cooler temperature provides for wines with a different personality. (Think all the sub-AVAs within NAPA/Sonoma counties and why particular varietals are chosen to be sited there). Naturally, Fenn Valley works to match the most appropriate varietals with their unique environment and growing conditions and has been doing so since their founding in 1973, making changes along the way. 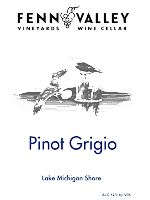 But before going on (there are other sources for this) about the history of Michigan’s AVAs, let’s talk about this wine: Pinot Grigio. Pale lemon-green in the glass, the nose presents (for me) salinity, wet stone, kefir lime, then floral notes of lime blossom and a very delicate vegetative note that adds a savory quality. For me, that speaks Alto-Adige Italian. And while every palate is different, I was struck that others referred to this wine offering tastes of ripe peach and pear, which indicates grapes grown in a warmer climate. It was the wine’s citrus character: Lime – soft, not bitter, dry and with a mouthwatering acidity dominating a hint of lemon that kept me coming back to experience the bottle’s contents. This contrast in opinion is interesting because Pinot Grigio in the minerally-citrus style is what cool climate PG is all about, while the stone fruit style traditionally defines a warmer grown climate in this varietal. But most interesting is that everyone tasting Fenn Valley’s PG found it delicious regardless of their tasting notes. As for me, I’ll hold with this wine being in the Italian style. Still, I wonder, is this a wine for all people? I don’t know, but with a price of $14, you might want to host your own tasting experience and find out. Fenn Valley Vineyards, the only vineyard/winery within the Fenn Valley sub-AVA (Est 1981) benefits from their placement high atop a sandy ridge. The vineyards are sloped so that denser, cold air drains off on colder nights. This prevents vine-killing frosts while still assuring grapes make for wine with a crisp character due to acidity. This placement (site selection) also provides for longer “hang time” assuring ripeness of the berries without “cooking” the grapes. The AVAs within Michigan are unique although Fenn Valley Vineyards will, at times, label their wines with the larger “Lake Michigan Shore” appellation (Est 1983) because it is better known. Lake Michigan Shore, as an AVA, is Michigan’s largest and holds 90% of Michigan’s vineyards. Near the resort area of Saugatuck, Michigan and an easy drive from Chicago or Holland Michigan as well. I particular enjoy their Rieslings, Chardonnay and cool grown Cabernet Franc (with the Cab Franc reminding me of those from the Loire Valley – Chinon). The 2016 Vintage won GOLD at the 2017 Michigan Wine Competition.